I am so happy today to do this guest post. Excited, this being a new experience for me and bit nervous too bcoz it's Appu's blog Flavors and Colors. We follow her blog regularly and I have tried so many recipes from here. So when she recently asked to write a guest post here it was nothing less than any oscar for me. Thank you so much dear for this opportunity and honour! About me, I am a housewife, mother of two cute kids, now settled in Trivandrum. Being born and brought up in Kanhangad (North Kerala), naturally my love towards Kerala cuisine is huge and all my recipes and taste is largely influenced by this cuisine. 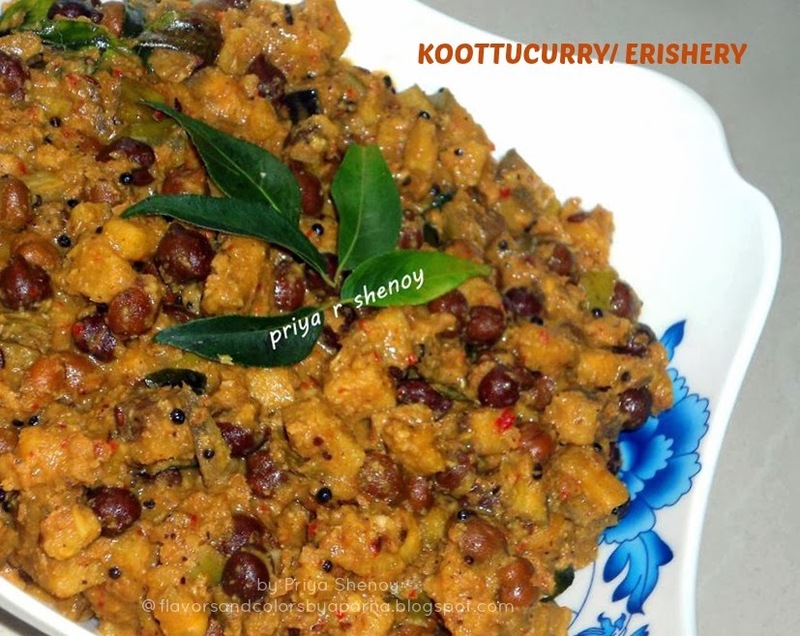 Today I share the recipe of a dish " Koottucurry or Erishery" from North Kerala, to be specific from Kanhangad. It is a side dish served with rice and a must curry for every malayali feast. This dish is very close to my heart, because from my childhood days I always loved this curry and now it's a favourite one of my hubby too :). The unique combination of black chana, raw banana [preferably the kerala plaintain) and yam makes this dish tastes heavenly. Soak the chana for 8 hours and then pressure cook. Grind the coconut, red chillies, cumin seeds, pepper and garlic into a smooth paste. Keep it aside. Cut the raw bananas [with the skin] and the yam [peeled] into small cubes. Now cook the vegetables in a large pan adding sufficient water. When they are almost cooked add the cooked chana and salt to it. Next add the ground paste and mix it nicely. Cook further and let it boil nicely. Once you get the desired thick consistency switch off the flame. Thanks appu for this lovely opportunity ! Priya, I salute you for the enthusiasm you show and the passion you nurture [being a mom myself to two kids, I very well can imagine the situation and know how difficult it is to do so] Thanks to you for taking your time and visiting Flavors and Colors. erissery looks super yumm. Perfectly made.